We are so excited to announce the promotion of three of our wonderful staff members to Vice President positions! 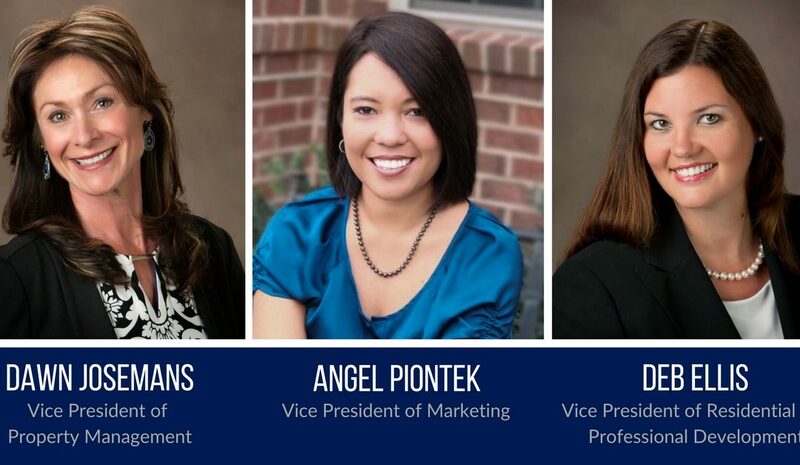 These three staff members have been integral to our company’s success and we are thrilled that they will be continue to provide our agents and clients with exceptional support and service. Dawn Josemans, formerly the Director of the Property Management Division, is now our Vice President of Property Management! Dawn will continue to lead the bustling Property Management Team based out of our Massaponax office which manages several hundred units for Coldwell Banker Elite. Dawn has an incredible work ethic and her success speaks volumes about her integrity and commitment to her clients and co-workers. Dawn is dedicated to continually educating herself on the latest trends, market changes and new industry laws & regulations. Angel Piontek, formerly the Creative Director, is now the Vice President of Marketing! Angel will continue to manage the Marketing Team and design the company’s future marketing campaigns. Angel’s degree in Communications and prior experience with an advertising firm give our agents and sellers the ability to truly tell a home’s story and market each unique property to the best of their abilities. As Vice President of Marketing, her primary focus is to foster a structured, yet flexible environment that attracts the best talent and creates an environment of collaboration, productivity and profitability. Deb Ellis, formerly the Managing Broker of our Massaponax office, is now our Vice President of Residential Services! Deb will be supporting our managing brokers and spearheading our agent education and coaching programs! Deb’s commitment to exceptional service and professionalism has fueled her coaching and mentoring of agents to find their highest possible success. Her relentless optimism and advocacy on behalf of her agents and peers make her a joy to work with and will continue to bolster the strength of our team of managing brokers!